Our food safety training and certification courses are accredited by the American National Standards Institute (ANSI) and are a benchmark for the food industry. ANSI accreditation helps assure quality and safety of food products, systems, services, and personnel. This accredited exam is accepted in most states and jurisdictions that have mandatory certification requirements for Food Management Professionals. The final exam must be passed with a 70% or higher to get credit for completion of this course. Before the Exam: To login into the exam you will need the username and password sent to you in the exam enrollment notice email. If you did not receive your username and password contact Customer Support at 855-796-3525. IMPORTANT: You must have your Username and Password available when you arrive to take the exam. This course serves as a study guide for all those who are preparing for certification as a Food Safety Manager. This course covers food safety issues, regulations, and techniques to maintain a food-safe environment. It will help you to better understand how handling food correctly is not only the law, but it improves safety and lowers cost as well. Develop a better understanding of food safety, its importance, and those who enforce it. Describe the types of food-borne illness and causes. Discuss the types of biological, physical, and chemical contamination. Recognize the importance of proper personal hygiene in the workplace. Identify cleaning, sanitation, and facility design. 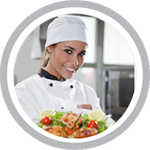 Package Description: The Learn2Serve Food Safety Manager Principles Course provides necessary training leading up to the Food Protection Manager Certification Exam. This course covers food safety issues, regulations, and techniques to maintain a food-safe environment. To become a Certified Food Protection Manager, a candidate must pass a food safety examination from an accredited certification provider as recognized by ANSI-CFP. The certificate will be valid for a maximum period of 5 years.